Traffic at the four-way stop at Home Road and state Route 315 started to pick up around 3 p.m. on Monday, March 11. In July, the bridge spanning the Olentangy River (pictured) will be closed and rebuilt as part of a Delaware County project aimed at improving traffic at the intersection by widening the east and west sides of Home Road to add additional lanes. 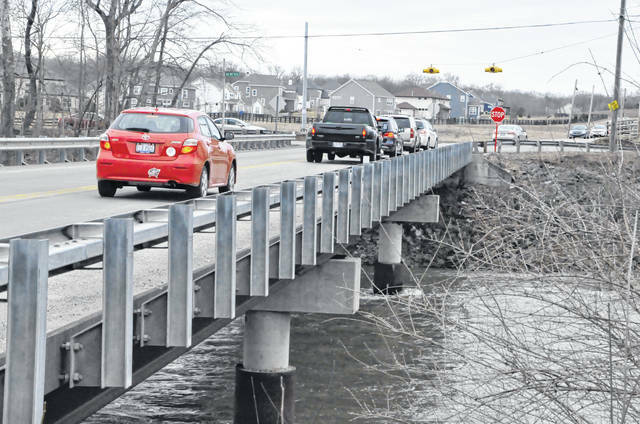 According to the Delaware County Engineer’s Office, the widening of the Home Road bridge at state Route 315 will have environmental impacts that will need to be mitigated. Commissioner Barb Lewis, a former Genoa Township trustee, asked Riley how long have the mitigation regulations been in force. Riley said linear impacts to the stream add up quickly and tend to be the most costly of the permits. “I know that we pay this firm S&W (Stream and Wetland Foundation) $33,000, but what do they actually do with it?” asked Commissioner Jeff Benton. Riley said the foundation works with the Ohio EPA to find and purchase acreage with good wetland features elsewhere to create a wetland mitigation bank to offset the area lost due to the construction. According to Delaware County Engineer Chris Bauserman, the county has partnered with Preservation Parks of Delaware County in the past to create wetland easements within the county. He said the land purchased by the county becomes part of the parks system. Riley said the stream impact regulations are a recent change that causes some “consternation.” He said the Clean Water Act regulates the impacts below the ordinary high waterline. Riley said the Ohio EPA regulates the vegetation around the stream. He said in order to prevent contaminants from getting into the stream, the Ohio EPA wants a “vegetative state” along each side at a specified distance from the edge of the stream. Lewis said she wonders what happens in counties that don’t have the resources that Delaware County does. Back in November 2018, commissioners signed off on the widening of Home Road at the intersection of state Route 315, which will add additional lanes to handle the increase in traffic that has resulted in backups, especially during peak hours. He added the project has an estimated price tag of $8.5 million, and the work will begin with widening the bridge on Home Road that spans the Olentangy River. Bauserman said the project is expected to begin in July.